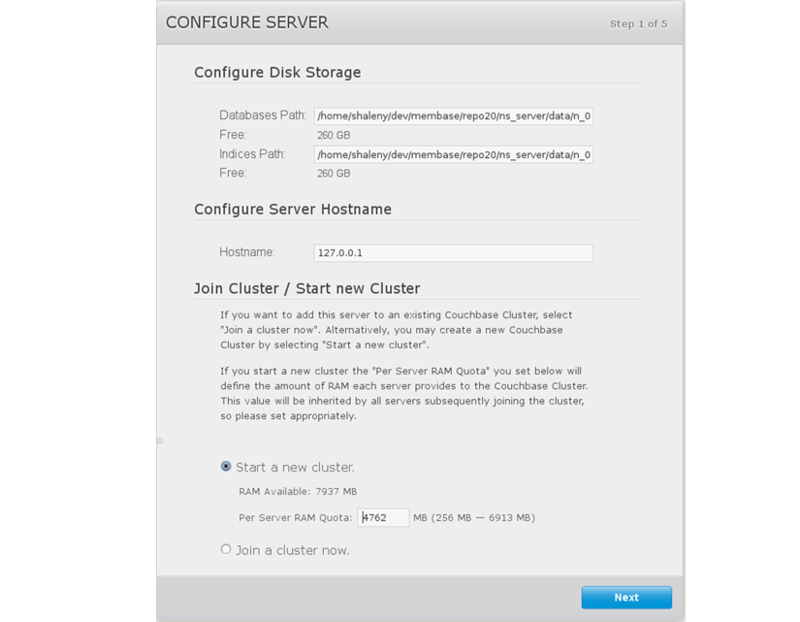 Each Couchbase Server's instance can have its own hostname. When you first install Couchbase Server, you can access it using a default IP address. There are cases, however, when you want to provide a hostname for each instance of a server. Each hostname you provide must be a valid one and will ultimately resolve to a valid IP Address. If you restart a node, it will use the hostname once again. If you fail over or remove a node from a cluster, the node needs to be configured with the hostname once again. There are several ways you can provide hostnames: when installing a Couchbase Server on a machine, when adding a node to an existing cluster for online upgrade, or via a REST API call. Couchbase Server stores the hostnames in a config file on the disk. In the first screen, provide either a hostname or IP address under Configure Server Hostname . The provided hostname survives node restart. If a new node is being added to an existing 2.0.1 or earlier Couchbase cluster, first set up the hostname for the new node in the setup wizard. Add a new node to a cluster by providing either a hostname or IP address under Add Server > Server IP Address . Provide a host name for a node a host name with the REST request at the /node/controller/rename endpoint .